This weekend, Carol and I were craving another round of pancakes, so we decided to try out Blanche and Bill’s Pancake House in Bridgewater Corners, VT, stopping off to pick up Graham for a third opinion. After a fairly long drive out to Bridgewater Corners that reminded me that Bridgewater is actually a bit of a haul from the Upper Valley proper, we arrived at Blance and Bill’s, which at 9am was still fairly quiet (but by the time we left, the place had a pretty long line starting to form). The restaurant has a very interesting interior, it’s equal parts New England backwoods restaurant and Red Sox shrine, with almost every available square foot of non-Red Sox wallspace covered with pieces of paper describing the restaurants policies (“No substitutions on specials, because then they wouldn’t be special!”) and a nearly infinite list of “specials”, mostly named after people and local restaurants. Seriously, I’m not sure why they have an actual menu at Blanche and Bill’s, since virtually any combination and number of food items you might ever want is available as some sort of special. I ended up with the Mike’s Special (blueberry pancakes, bacon, sausage), Carol ended up with the Corner Store Special (the same, but with a blueberry waffle), and Graham ended up with the Pizza Jerk’s Special (pancakes, eggs, and bacon). Apparently, Blanche (Bill passed away several years ago) is pretty fanatical about her pancake batter, allowing it to rest several days before cooking. And the pancakes showed it, the batter was fluffy and not rubbery, and had a very good crisp. Same with the waffle, so I think they’ve got the batter thing down pat. I also enjoyed the sausage, but the bacon was just your normal bacon (I’ve been spoiled by all the places with nicely smoked, thick-cut local bacons, I guess). And, somewhat disappointingly, the blueberry pancakes and bacon didn’t have the blueberries in them, but were simply topped with copious amounts of blueberry topping. It might just be me, but I really prefer it when the blueberries are baked in (although I do undertand from my own cooking that this makes for a messier grill). But, all in all, it was a very pleasant location, the portions good, and the pancakes were definitely well-made. Blanche and Bill’s isn’t even close to topping my pancake list, but definitely makes it onto my “good” list, and I don’t think others will be disappointed. 1. The pancake and waffles themselves are very well done. 2. Atmosphere. Between the many signs (both specials and screeds) and the locals, this place is chock full of New England goodness. 1. The blueberry topping was a letdown on some otherwise very good pancakes. 2. The drive. It’s definitely a haul to get to Bridgewater Corners. On the flip side, use it as an excuse to do some of the other Bridgewater attractions, such as the Long Trail Brewery, Umpleby’s Bakery, and the Hillbilly Exchange in the basement of the Bridgewater Mill. My husband and I have made Blanche and Bill’s our destination on trips from southern New Jersey for 25 years now, and we both find the blueberry sauce delicious and special on top of the best waffles, pancakes and French toast ever! We purposely stay near Bridgewater Corners in order to eat at Blanche and Bill’s as often as possible. Blanche is a “sweetie”, and this restaurant is a very special place! My friends and I are from NY and have traveled to the Killington area for many years. We ALWAYS make a stop at Blanche and Bill’s. The pancakes are the very best and so is the wonderful lady bringing them to the table. We are simlpy know as the “NY boys” and made plenty of bets with Blanche over the Red Sox/Yankees duels! I’m from Maryland and I have been going up to New England for the fall colors for about 15 years. 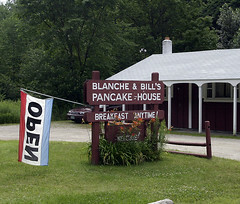 No matter where I go – Maine to Lake Placid, NY – I always find my way back to Blanche and Bill’s. Just the best pancakes I’ve ever had, and I love the atmosphere. I learned about Blanche and Bill’s from a New York Times article many years ago. 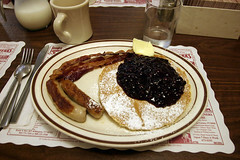 The reporter did his own personal survey of the best pancake places in Vermont. He listed four. I tried them all. They were all good, but Blanche and Bill’s was the best and still is! Wife & I really LOVE this place. Very High Quality ingredients; excellent Delicious Preparation & Presentation; Very Good Service: and especially Very Nice Chef-Owners. We spend 3 months in Vermont, & this is one of the destinations we look forward to going every week. The absolute best waffles on the planet. Classic and thin, crispy and the syrup is amazing too. I got two, one regular with butter and one with blueberry sauce, powdered sugar and butter… wow, the best waffles evvvvvver!!!!! A must go to place in Vermont!! !